I had a huge love for Texas Roadhouse and it’s no secret that the reason I always wanted to go there was for their to-die-for rolls! Now, I’m happy to share with you a Copycat Texas Roadhouse Bread recipe and how to make their cinnamon honey butter also! This Texas Roadhouse Bread is so good, you’ll need to plan a few per person. I usually end up eating 2 or 3 with my meal! See more Easy Recipes in our Recipe Index! What is Texas Roadhouse Bread? Only the most amazing melt-in-your-mouth roll you’ll ever try. They are hot from the oven and soft and fluffy inside. Top the bread with a dollop of their cinnamon honey butter for the perfect combination. Scald milk by boiling and then allow to cool to warm temperature. Then, you will add yeast, honey and milk to bowl and mix. Let it sit for at least 5 minutes (allow yeast to bloom). Put yeast mixture, 3 tablespoons melted butter, egg and 2 cups of flour into bowl of stand mixer. Mix on low using the bread hook until smooth. Keep slowly adding flour until dough comes together. Add salt and allow to mixer to knead for 8 minutes. Flour work surface and turn out dough and knead for a few more minutes. Spray bowl with cooking spray and place dough in bowl. Cover with a damp cloth or plastic wrap and let rise in a warm place until doubled (about 1 hour). I live for my glass measuring bowl, it’s so handy for absolutely everything and cuts down on dishes! Spray 2 cookie sheets with cooking spray. Punch your Texas Roadhouse bread dough down and turn out onto a floured work surface. Roll dough into a rectangle, about 1/2” thick. Fold over and gently roll to seal together. Preheat oven to 350°. Bake the bread for 12-15 minutes or until golden brown. Brush with remaining melted butter. Then, serve with the most amazing honey cinnamon butter, just like the Texas Roadhouse Butter!! 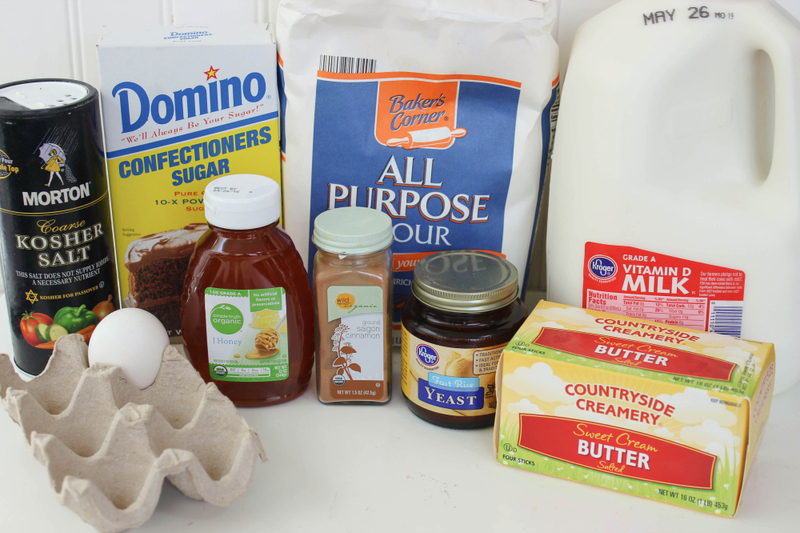 To make the Cinnamon Honey butter, whip all ingredients together until smooth. 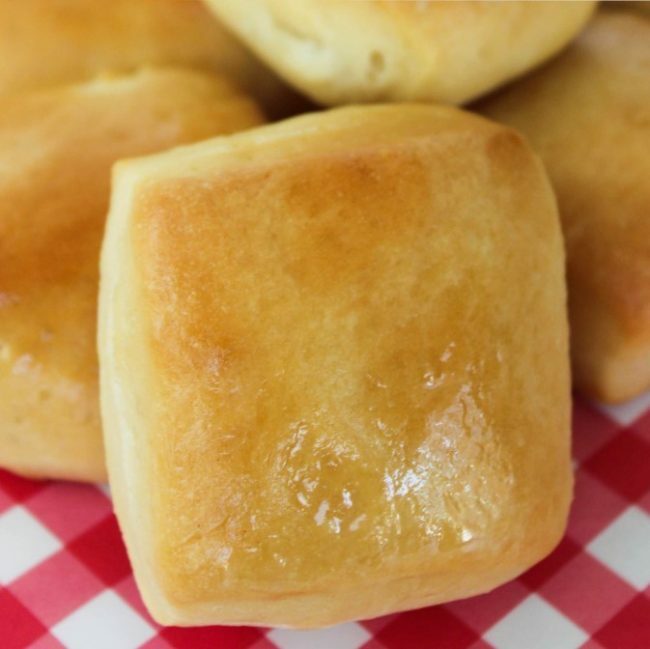 This Texas Roadhouse Bread recipe will melt in your mouth and become a family favorite! Makes 24 rolls. Scald milk by boiling and then allow to cool to warm temperature. Add yeast, honey and milk to bowl and mix. Let it sit for at least 5 minutes (allow yeast to bloom). Spray 2 cookie sheets with cooking spray. Punch dough down and turn out onto a floured work surface. 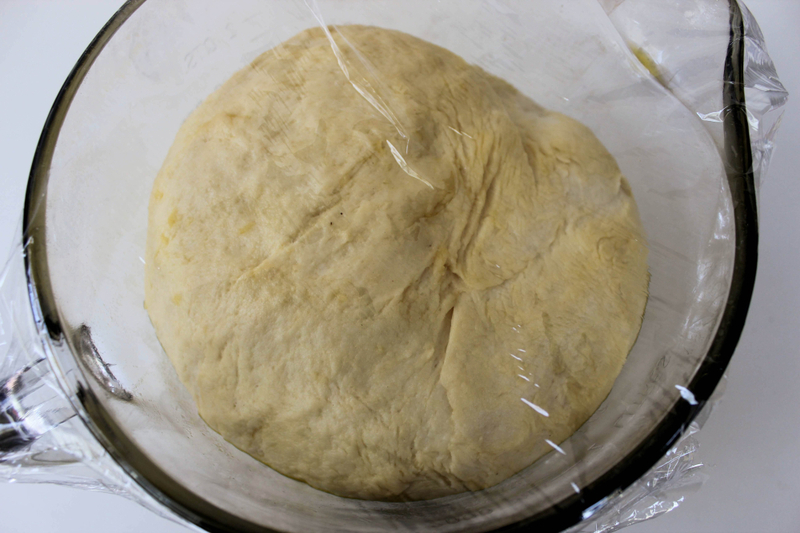 Roll dough into a rectangle, about ½” thick. 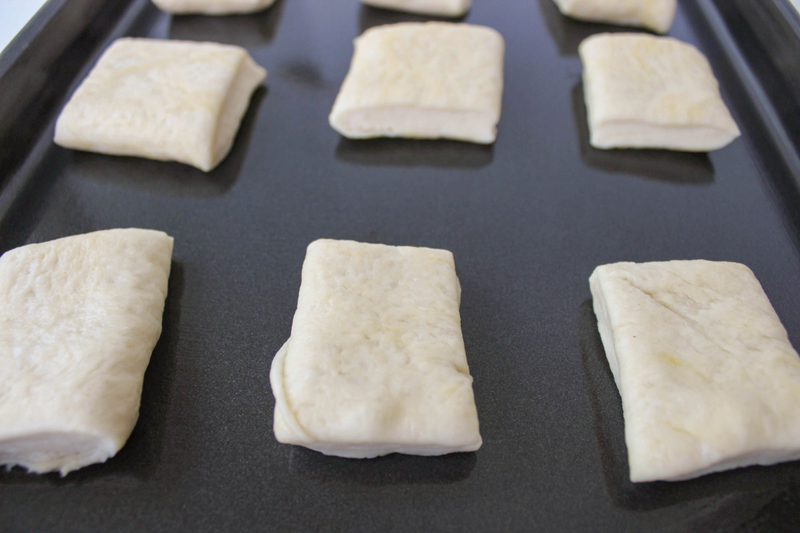 Fold over and gently roll to seal together.Cut into 24 squares and place on prepared sheets about an inch apart. Cover and let rise until almost doubled in size (about 40 minutes). Preheat oven to 350°. Bake 12-15 minutes or until golden brown. Brush with remaining melted butter. Want another yummy bread recipe? Try this super easy Drop Biscuits recipe! How many Texas Roadhouse Rolls can you eat in a sitting? Oh my goodness those rolls and biscuits are so delicious! I’m so glad you made this copycat recipe! Totally going to try to pull this off! Thanks. I remember the last time we went to Texas Roadhouse having these rolls. Now I do not have to wait any longer and will be able to make them myself. I love the recipe for the cinnamon butter because that can be welcomed on just about anything! Yum! I am pinning this, it looks easy enough that even my 13 year old could make it. I love copycat recipes! Not only does this look delicious it sounds delicious too! 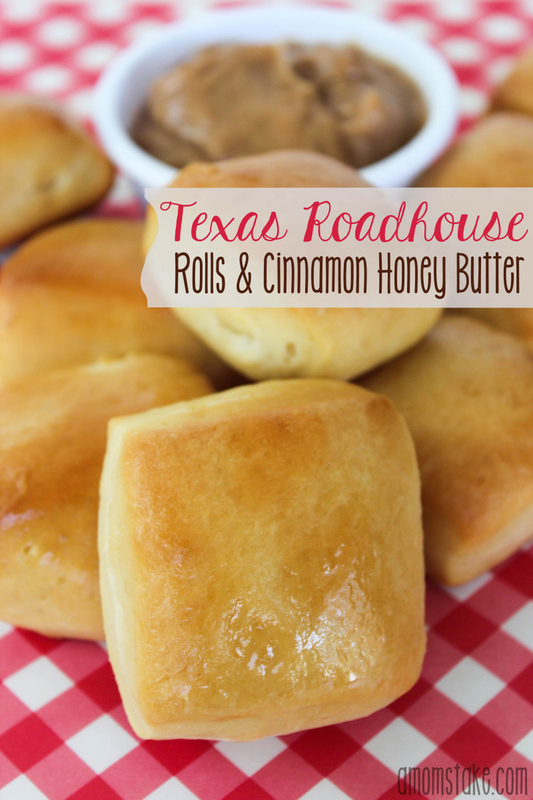 I absolutely ADORE the Texas Roadhouse rolls and oh my goodness that amazing butter too! Thanks for sharing this recipe. I am really excited about making these. Ah! How I love those rolls! I could sit there and eat just those for dinner every time! I’m just learning to bake with yeast and the scalding of milk kinda scares me, but my love for these rolls makes me have to try this recipe!